I often find myself searching for hikes that feature my favorite thing: water. There is no better time to indulge in the outdoors now that most forests are reopened and summer time is dwindling. I&apos;ve spent many weekends exploring the desert for a little relief, and these are my favorite hikes with an oasis at the end. Leave your climbing rope at home, this hike is an easy one. Travertine Falls is a short hike on Crest Trail 130 in Tijeras. The overall trail curves up the Sandia Mountains for 1.6 miles, but the waterfall can be found only half a mile from the starting point. Okay, waterfall may be a bit generous, but it is a perfect place to stop, catch your breath, and cool off nonetheless. The trail is kid approved, and your four-legged (leashed) friends are invited too. Pro tip: Venture to the top of the waterfall and inside the adjacent cave for an added biology lesson complete with fossils and some of New Mexico&apos;s best critters. This fall is nestled into the Nambé Pueblo and offers two options. After paying the $15 entrance fee you will be directed to either the “dry” or “wet” trail, both aptly named. The quarter mile dry trail will take you up a gentle incline to a birds-eye view of the tiered waterfall. If you’re looking for a more challenging and refreshing hike, brave the quarter mile wet trail, water shoes recommended. Be warned, the water is cold. The trail will take you winding and crossing the river upstream for half of it. The hike is worth the frozen toes. The lowest pool is the perfect place to relax and listen to the falls. Pro tip: Don&apos;t forget to bring cash and be aware of limited hours in the non-summer months. Location: In the Santa Fe National Forest, about 60 miles from both Albuquerque and Santa Fe. 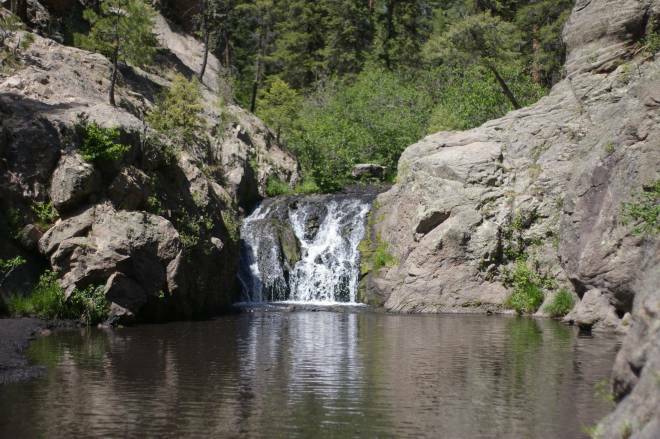 Jemez Falls is the perfect combination of the true New Mexico style forest that Travertine Falls showcases and the unexpected water Nambé Falls features. The hike will take you to a scenic overlook that provides a full view of the falls, just a little longer and you will find yourself at the shallow pool to cool off and enjoy the view. Pro tip: Bring a book. The rocks surrounding the pool make for the perfect lunch spot, so pack a sandwich and relax. This “hike” destination is a step out of your car. Drive just over an hour north of Albuquerque and keep your eyes open along Highway 4 and you’ll see Soda Dam. Sitting 50-feet high and 300-feet wide, the dam blocks the Jemez River, forcing it into a spectacular cascade. There may not be a hike leading up to this oasis, but there are plenty of rocks to monkey up and the perfect setting to just sit and eat, read, or sleep. Pro tip: Drive four minutes west and you’ll find the Spence Hot Spring trailhead where a beautiful hot spring nestled into the Jemez Mountains can be found just 0.6 miles from your car.